Livvy always dreamed of the day when a rich, handsome hero would appear and whisk her away from her mundane life. She never thought she would be the one doing the saving. Reading the emotions of people around her is easy for Livvy. When an earthquake strikes her city, a supernaturally attractive group of rescuers show her that her power goes beyond that. She’s now one of them. Special. But the dream life she’s been swept into seems too easy, and soon turns into a nightmare. I enjoyed Emotionally Charged, for the most part, but I feel that it wasn't long enough This could have definitely been a full length novel instead of a novella. 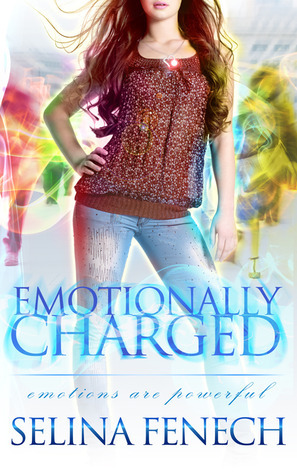 It had a really interested concept--Livvy could not only read other's emotions, but they basically fueled her and gave her some above average powers. When it started off, I wasn't particularly pulled to Livvy, because I felt like she was making some weird choices, so I just read the story as a bystander to see what she would do. Then things started happening, some pretty big things, and I got into the story way more. I wanted to see what Livvy would do, how she would handle the situation. Again, I wish the story was longer! The romance was cute, but I think it could've really blossomed into something sweet if it was given the time. Overall, I good, quick read. I finished it in about 45 minutes. If you're looking for something like that, that you can finish easily and enjoy, then this is definitely your book! 4 stars.